Sharing a surplus of organic food and seed comes top of the list. Last spring was exceedingly dry, conditions that made it the best spring seed harvest from winter crops. Though hot – and ultimately very wet – this summer was good for avocados in Bayside Brisbane. So this weekend, Chas and Gail, my neighbours, are giving me three crates of surplus organic avocados to give to our first visitors. Bayside Brisbane also had a good year for jackfruit, pomelo and other citrus. I’ve made jam with surplus citrus and rosella and have pomelo and mandarin seedlings. 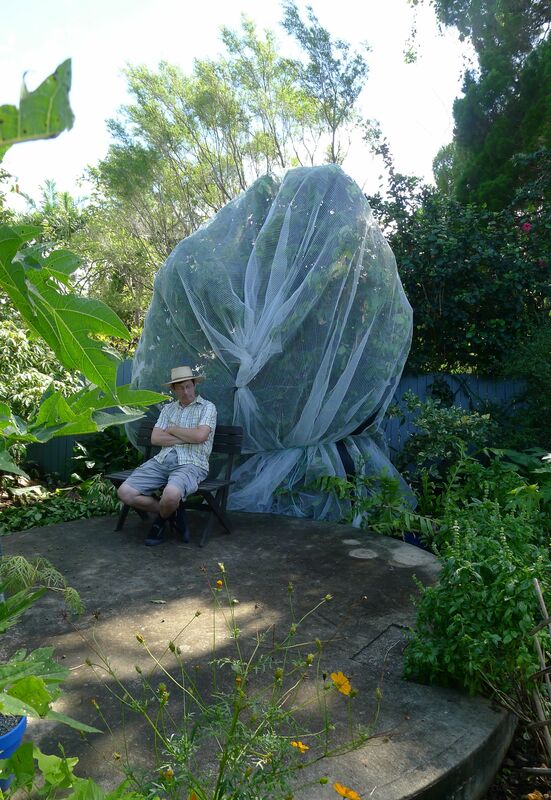 This is the seventh year I’ve opened my garden through Open Gardens Australia. I try to share food culture – different ways to cook, and different crops to eat. Organic gardening is good for the environment, and this weekend you can see an example of wildlife-friendly fruit tree netting. The standard, single filament fruit tree netting – the kind that every garden centre and hardware store sells – traps, maims and often kills birds and fruit bats. Once trapped, struggling animals then attract snakes, which also often get trapped. Gardeners trying to release trapped wildlife get bitten by poisonous snakes more frequently than you realise. So check out my bird and bat-friendly alternative netting technique and learn how to use it. Thanks to Bat Conservation & Rescue, Brisbane, this win/win keeps gardeners and fruit bats safe. My 813 square metre garden is a result of (close to) ten years of organic gardening. Originally, the soil was worm-free and full of nutgrass. As you will see on this week’s ‘Gardening Australia’ show (ABC 1, Saturday 11th September at 6.30pm) my soil was once worm-free and hard enough to break the blade of a rotary hoe. It took five years to create fertile soil and conditions that provide abundant, diverse foods. I also get sugarbag and products for healing, like Aloe vera. Visitors can see rare heritage crops, like ‘Parramatta Sweets’ mandarin (from NSW), ‘First Fleet’ coffee (from Rio de Janeiro, 1788) and the ‘First Fleet’ lettuce that once fed convicts at Farm Cove. I’m pleased to say this lettuce has now been repatriated to the Royal Vegetable Garden in Balmoral, Scotland, with the approval of HRH Elizabeth II (in October 2011). Another celebration is the maturing ecology of my food garden. The outlook is not good for pests, especially grubs and caterpillars. Normally anything up to six species of beetle grubs – curl grubs – chew into root crops, spoiling them. Here, Black hairy flower wasps have vanquished these grubs, and to keep things in my favour all I need do is use a special mulch under certain trees. This summer, two special parasites moved in. One is an ecto-parasitic fly, an Argentinian biocontrol (the Tachinid fly, Trichopoda giacomellii) released by the CSIRO near Moree to cull the native Spined citrus bug (Biprorulus bibax), a pest that spoils citrus fruit. The other is a Leucospis wasp that parasitises other wasps which in turn parasitise caterpillars. Entomologists have been unable to identify the Leucospis wasp, which is probably a new, undescribed species (see gallery below). I’m keeping my fingers crossed. My garden is thrifty to run. Guinea pigs help maintain my lawn, and running the rest of the garden takes one person 8 – 10 hours a week. I’ve learned not to rely on the potato. Instead, I grow yams, arrowroot, cassava, sweetpotato and cocoyam. They cope better with our droughts and floods. I’ve learned how to prepare meals with green bananas instead of rice, I create experimental pestos and use green pawpaws instead of spuds. Many of the two hundred food plants growing here are volunteers – self-sown seedlings. Volunteers make food growing easy, productive and reliable whatever the weather. Mineral deficiencies have been overcome by active monitoring and soil improvement, and consequently my crops are healthy. I reckon food is my medicine, and garden fresh foods add vitality to my diet. If, like me, you have 117 different foods on the menu, who needs ‘superfood’ or vitamins? Hi Jerry. I’m looking forward to meeting you on Sunday. I’m doing similar things (:>) and my friends have told me about you (who are acquainted with you). Thanks to Jerry and his team of helpers for opening up ‘Bellis’ over the weekend. It’s such a pleasure to experience a working garden by a Brisbane based garden specialist. Can you tell me where I can get more information about the aerial potato? I have this growing at home – at least I hope it’s the same one as I believe there could be a toxic version (?). Mine has a large ground tuber and no aerial bulbils like yours, not yet anyway. Would like to know a bit about that beautiful reddy-pink pineapple you had growing up the back. How do we get hold of different sorts of pineapples plants like that? Hi Jerry, I came to your open day on the weekend and fell in love with your garden. I live relatively close to you and was wondering if you provide a service of coming out to one’s home and making suggestions as to how things could be done better? I’m just starting out as a keen vegetable gardener and have so much to learn. Let me know if that’s something you do. Hi Jerry. One day I will make it up to your place. I am going to try turning a whole bed over to insect-attracting plants and see how that goes, as well as my current practice of spreading them through my garden. I have a very small garden area so this is a Big Thing for me! I have also decided to join the Open Gardens Australia program, the better to “infect” the general population with Permaculture! Thank goodness I am not a legendary Gardening Australia presenter because my little townhouse garden will be hard-pressed to cope with 100-200 visitors, let alone what was it last year? 1 700? Goodness gracious me! Good on you, Jerry! Tell me that wasn’t just on one day – or even one weekend?! I was wondering – how did you get rid of your nutgrass? We’re about to embark on a journey like yours (have bought and started clearning the 800sqm block, and in the process of building the new house on it), and we’ve recently found out that we have a nutgrass infestation! It’s basically covering the entire backyard (half of the block), where we intend to grow our organic vegetables / fruit trees etc. What should we be doing to get rid of it before we get started? I’ve read about sugar, but not sure if it’s a good idea or not. View the video ‘soils wars’ on this website. By sandwich mulching I have eliminated 400 sq metres of nutgrass.